When I was fourteen, I opened the door one day to a slightly older teen guy asking to see my brother. It was the first time I ever laid eyes on my husband Justin—enamored, proving the love-at-first-sight cliche. At least it was that way for me; he thought I was a dorky little girl. Ha! But it wasn’t long before I won him over! Thus began our ten-year history before our engagement. What took him so long to pop the question? Arguments. I always wanted to be right. We landed on-the-spot counseling sessions with my mom (and sometimes dad) many, many times. Have you heard of the allegorical foxes that spoil the vine? My mother used to quote Song 2:15 to my brother and me growing up, as part of teaching us how to treat people. She continued to remind me of this verse when my husband Justin and I started butting heads early on in our relationship. But as I grew to love the life-changing truths of the Word, I increasingly appreciated the wisdom of this verse. Let’s suppose for a moment that the vineyard is your marriage relationship. A vineyard bears fruit, so let’s say the fruit on the vine is the love, joy, peace, patience, kindness, goodness, faithfulness, gentleness, and self-control between you and your spouse. Finally, let’s call the foxes the obvious division-makers, such as adultery or physical abuse. The nitpicking fox. Arguments happen. I get that. However, allow me to give you some advice that someone gave me lots of times, but maybe you’ll catch on sooner: pick your battles. This means you don’t need to start an argument over the little nitpicky issues of life. When your spouse leaves his plate sitting on the table after eating, and it irks you, choose to let it go. However, if your love maxed out the credit card on a whim, then a discussion is probably in order. The unappreciated fox. Mundane tasks fall to your lot week-in and week-out. It goes a long way to thank the other person. For Christmas this past year, I tucked a thank you card into my husband’s stocking. In it, I listed every tiny task I could think of that he does for our family down to replacing batteries. I even noted solitary occasions such as going to the store late at night for medicine when someone in the family was sick. By the time he finished reading the card, we were both blinking back tears. 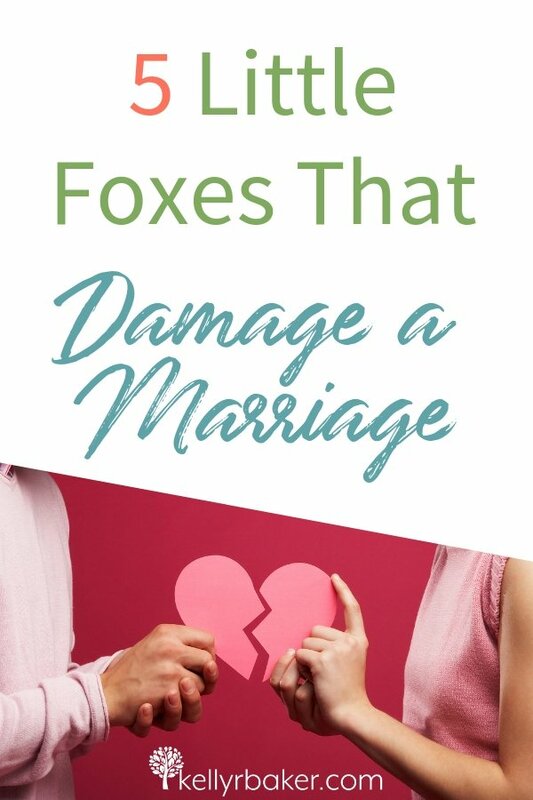 To find out what the other three small foxes are, join me at Messy Marriage. See you THERE! Do you know someone who would be encouraged by this post? Please use the icons below to share it! Thanks so much for sharing your story and important principles with us at Messy Marriage, Kelly! They are so true and have already touched a personal friend of mine. I appreciate you and your heart, my friend! Kelly, heading over to read the rest, but wanted to thank you for these cautionary words as I approach the thirty year mark soon. I don’t want to let down my guard. That’s an inspiring example, Michele! Heading over to read more about these little foxes!